The latest in Paul Carey-Kent’s rolling top ten, together with previous choices which you can still see. The titular Knafeh refers to a video in which the preparation and division of the sweetmeat, which is equally popular in Palestine and Israel, takes on a mutating spin-painterly quality in what Landau calls a ‘composition in motion’ over 15 minutes. That cues us in to the surrounding works: photographs of games in which demarcations are made in the sand, Tapies-like ‘sand works’ which set that into a more directly artistic context, marble sculptures of breastfeeding pillows which reinforce the body references and allude to Henry Moore, Louise Bourgeois and Sarah Lucas. Add some of Landau’s well-known stream of salt encrustations, and you have a resonant meditation on themes of nurture and conflict. The summary here might be interesting exhibition, great chairs! 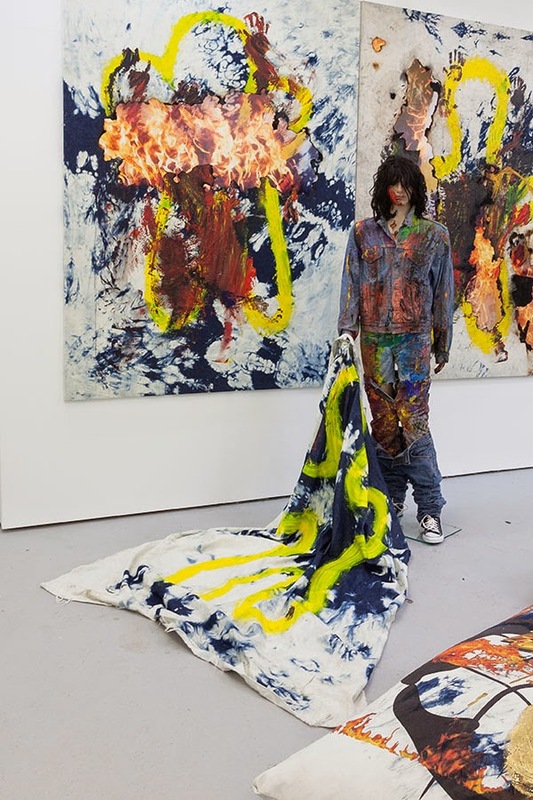 The show combines mannequins, cushions and video which both form Part 3 (2557 is the year 2014 in the Buddhist Calendar) of an ongoing account of New York based Bangkok born Korakrit Arunanondchai’s life and performances, and lead to the paintings shown. 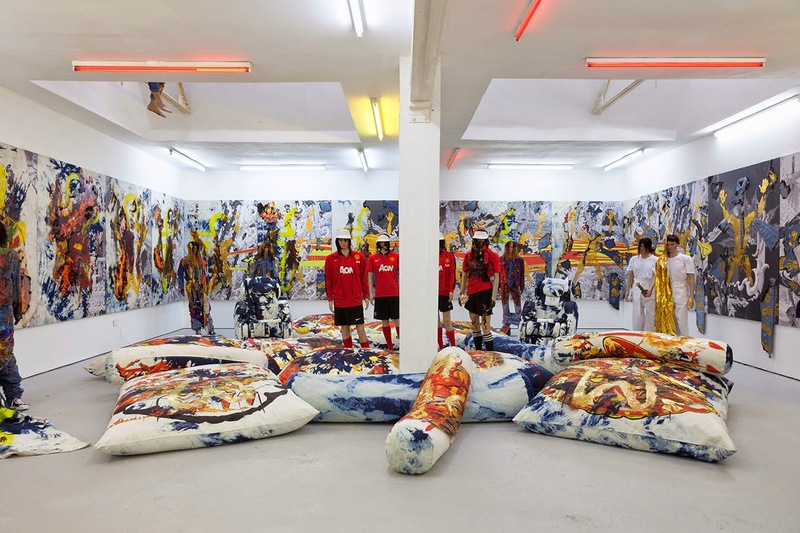 The whole merge Thai and Western media and art: a kitschy temple, burnt denim, body painting inspired by a TV game show, and Manchester United all play. 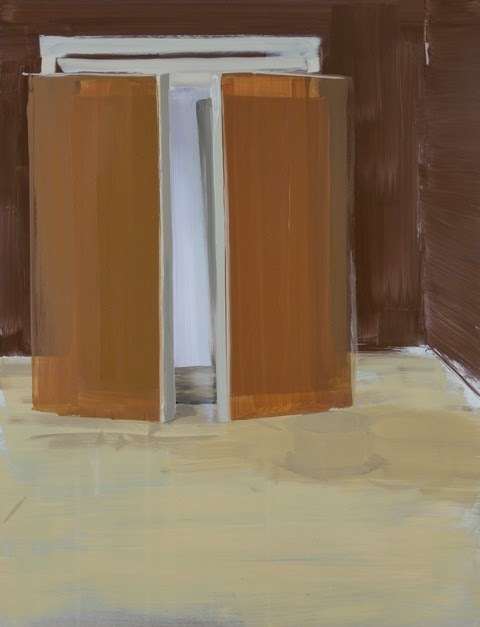 The paintings are just one aspect, but striking enough in themselves that Gregor Muir has included one in the ICA’s punchy survey of current trends. All the same, visitors may remember the show mainly for the invitation to view it from much the most pleasurable massage chairs I have encountered. If you saw the seven floors of HS Projects’ Interchange Junctions in the as-yet-unlet areas of this sparkling new office block, you might ask why only five floors? But of course, this seventeen artist examination of the interface between design and society is still huge. 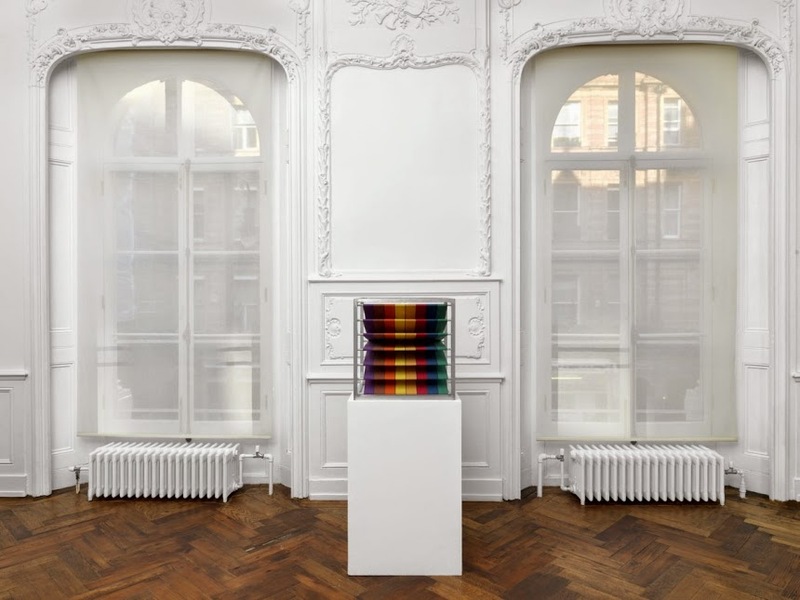 The highlights include and a face-off between Pilar Corrias (Elizabeth Neel, Tobias Rehberger, Ulla von Brandenburg) and Stephen Friedman (Beatrice Milhazes, Claire Barclay, David Shrigley, Kendell Geers). 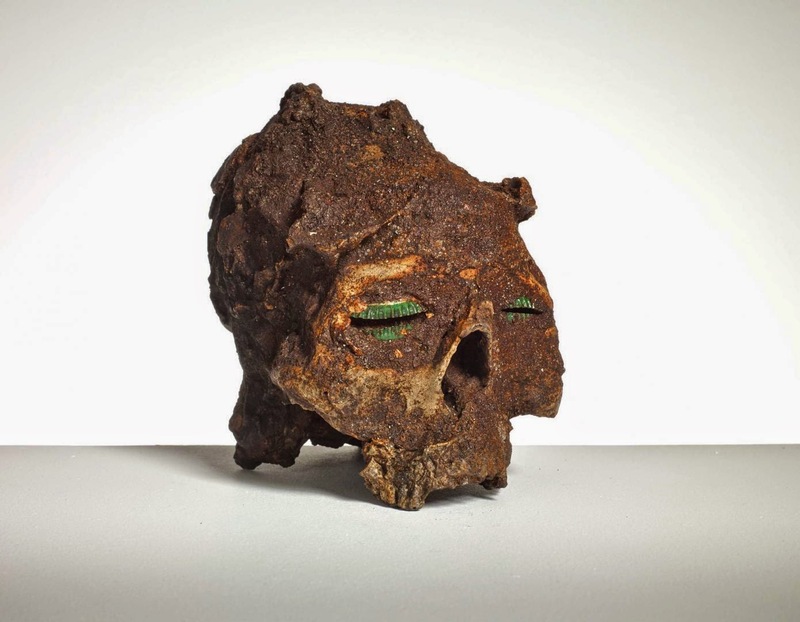 When the Belgian-based Africaans artist makes political work, it carries an authentic backstory, as he left his native South Africa when faced with spending six years in gaol for treasonable actions against apartheid. Here and in Geers’ concurrent solo show, that gives extra heft to his use of ideologically-charged readymade materials (such as razor wire), language (such as the four letter word, the negative shapes from which are insinuated into his Monuments to the F-Word) and his striking new use of plaster soaked in rust-saturated water to make skulls in which his own handmarks are prominent, as if clawing at death. Polish painter Mela Yerka’s show is titled from was Neil Armstrong’s second sentence on the moon, neatly introducing a painterly exploration of the overlooked. Five portraits of talented women – but whose lack of fame contrasts with that of their male lovers – are rendered in fluid mixtures of fresco, graphic and gestural abstract styles. 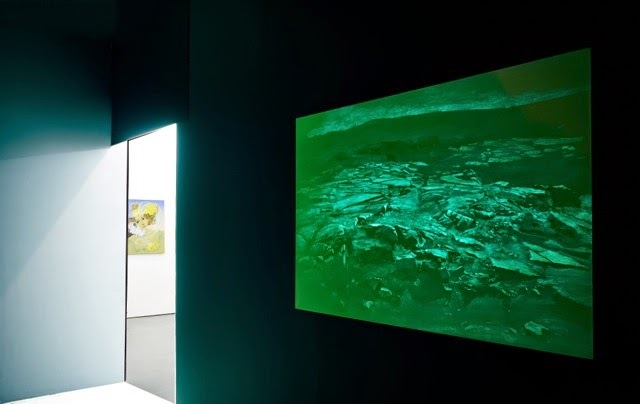 A separate room holds a blindingly lit and apparently empty canvas: only as the light – by which we normally expect paintings to be revealed – fades away in a three minute cycle does a landscape appear. It’s of Mars, and looks very ordinary – suggesting that location is all: were it here on earth, it would be totally overlooked. This Danish run space (‘Hus’ is ‘house’) has built an intelligent presence over its first year in the West End. ‘Space Age’, titled from Lucio Fontana, repurposes artists in a future-oriented manner: Santiago Taccetti – also born in Argentina – references Fontana most directly; German Ophelia Finke’s painted coats mix Holbein with astronauts and the fashion store; Czech Konrad Wyrebek shows us what photoshopped version of a classic Canova marble might look like; and Texan Nathan Green nods to Georgia O’Keefe as well as minimalism, framing painterly inventories of sculptural forms to push and pull the presence and absence of a curious old-new material: spray expanding foam with papier–mâché and sawdust. 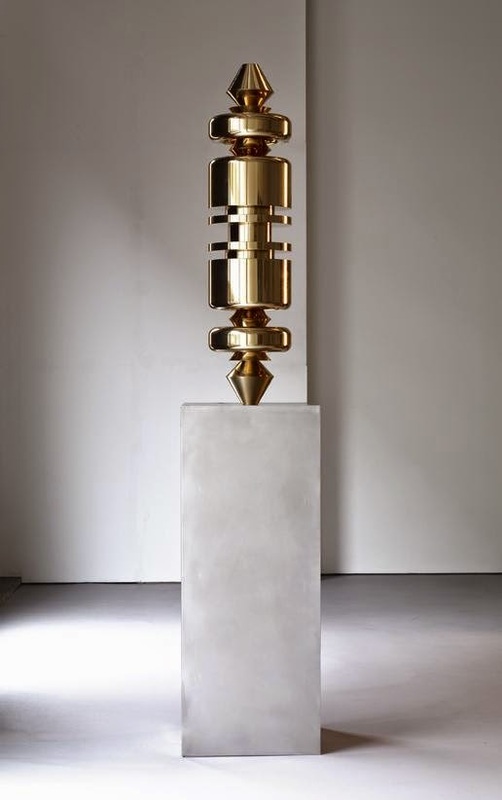 Richard Stone recasts art history through processes of removal, movement and addition, and Gleam’s grisaille combinations take that forward with the added benefit of a recent residency at an Italian bronze foundry. 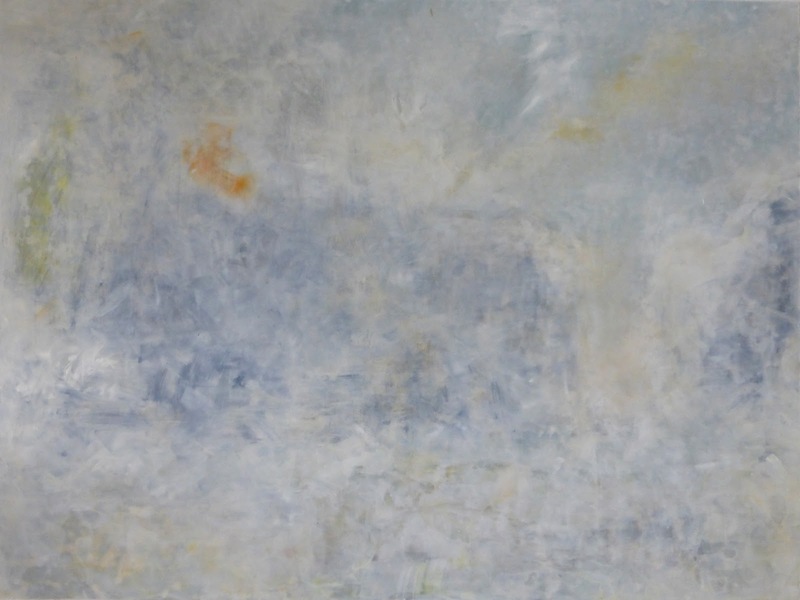 Thus the sanding away of an old painting may produce a ghostly homage to Turner; fresh abstracted landscapes emerge from paint slid across aluminium; when a land becomes a sea might have been called when my paintings of tide-washed rocks mutate; and what Stone previously discovered by dipping found sculptures into liquid wax to yield new hybrids, he now creates as primary forms in bronze or marble, like some sort of reverse play on the Venus de Milo. The most entertaining eleven minutes in a London gallery right now (make that 22 minutes: you’ll watch it twice) uses a brilliant formal device to deliver a distinctly current political charge. The Soundtrack in question is minutes 22-33 of Stephen Spielberg’s HG Wells adaptation ‘War of the Worlds’: a stream of gags enables Ben-Ner to match its sounds and dialogue to a home movie of him with his children: the blender stands in for a plane taking off, and there’s plenty of smashing and burning as the artist-father struggles to cook. Then a laptop shows the Israeli-Palestinian conflict: domestic conflict turns out not just to imitate the film, but also to stand in for wider politics – not so much the effect on the family of Hamas rockets (almost all exploded midair by the ‘Iron Dome’ defences) – but for the disproportionate impact on Palestinians of Israeli attacks. Contrasting somewhat with Diego Perrone’s restraint-free ‘Void-Cinema-Congress-Death’ (!) downstairs, all the right artists are chosen for a selection of abstract works featuring folding, crumpling and creasing, and Lygia Clark, John Chamberlain, Steven Parrino and Tauba Auerbach relate beautifully to the architectural setting of MDC’s upper rooms. 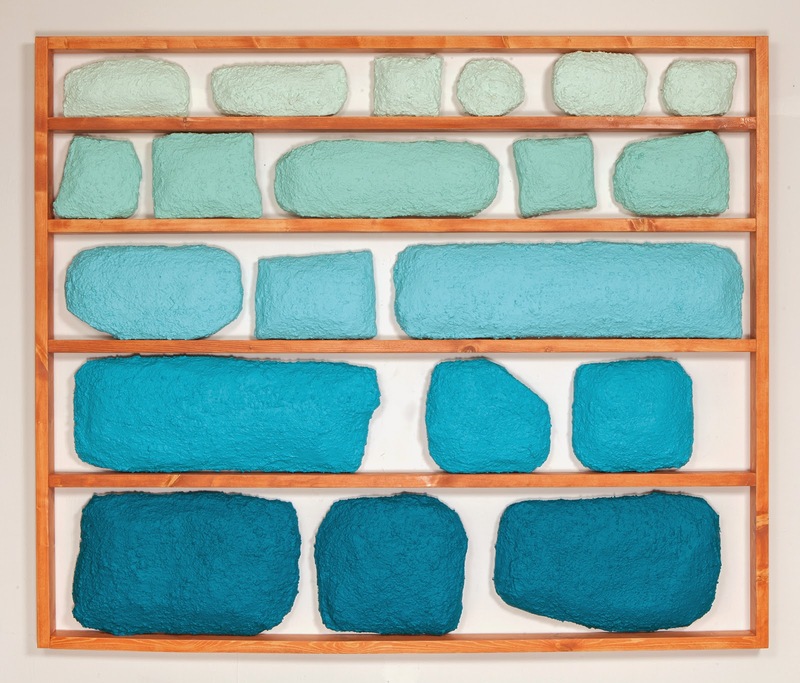 It’s more surprising to see Alighiero Boetti’s colourful Zig Zag, like a condensation of deckchairs; Luciano Fabro screwing up a leather map of Italy; and Judd as the apparent starting point, given his reputation for smooth finishes. 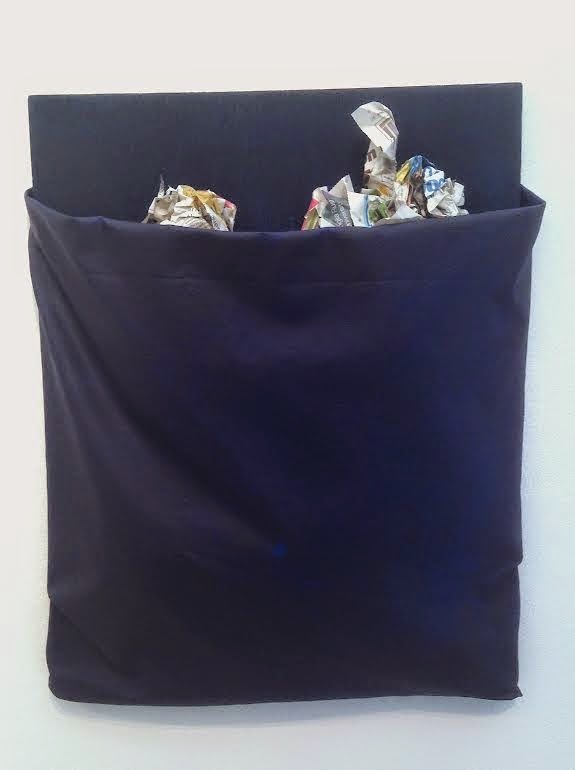 Untitled (1972/73), though, did involve folding sheets of galvanised iron. Its painterly quality – as the only metal with a surface pattern – plays strongly here. 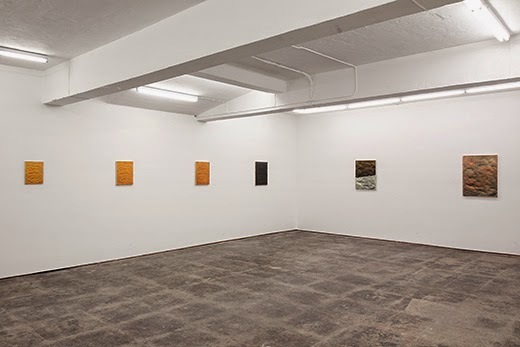 Seventeen’s big, square, new main space proves – in the first show after relocation – to be just the size for Sachin Kaeley’s cycle of ten paintings named literally for their materials. 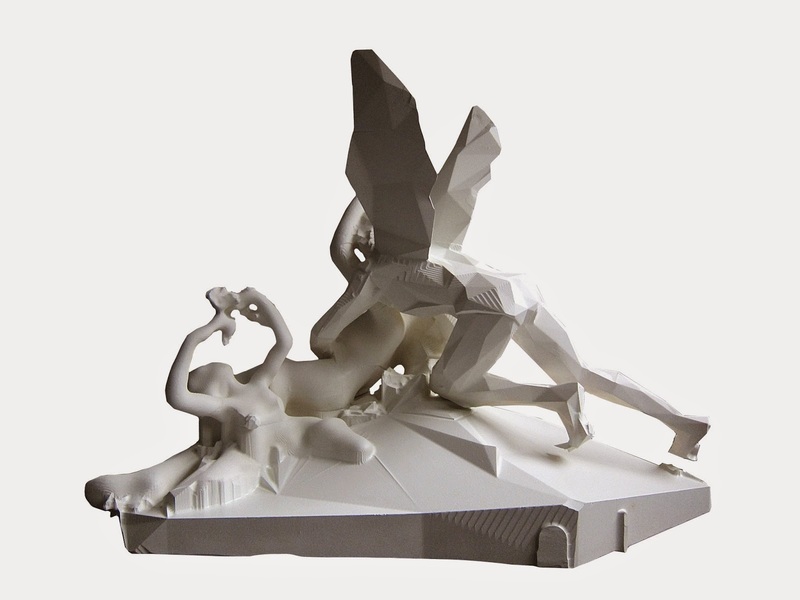 They start from a small (28.5 x 22 cm) orignating plaster cast, scraped, spray-painted and itself cast in a rubber material. 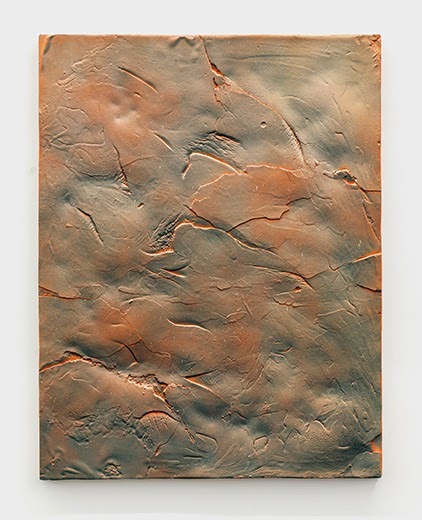 That rubber cast is stretched to 110%, then cast in plaster and spray-painted in its turn. And so on, until we’ve reached the 116 x 89.5 cm of the tenth work. Add the acretion of textures, a cycle of colour and the cobbling together of the 7th out of two fractured casts of No6, and you have a facinating analogue evolution of forms which somehow have the look of the digital about them. It’s no surprise that Cameroonian artist Boris Nzebo sports impressive dreadlocks, for these visions of his home city of Douala interlace elaborate hairstyles with busy architecture to merge individual and collective streetlife to dizzying effect. Two room-high triptychs push Jack Bell’s modest space to the max. 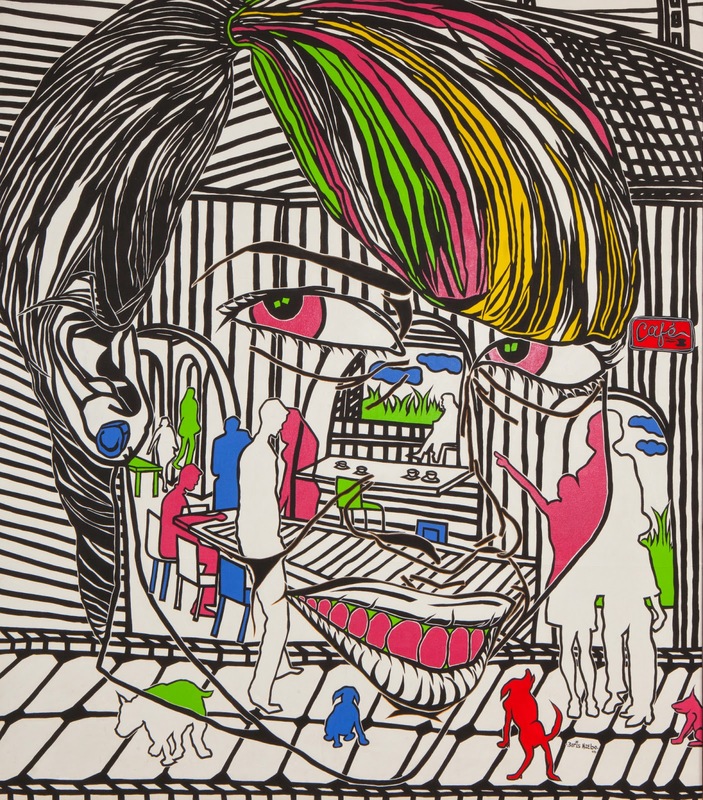 The complexity is kept under control by a clean painting style with echoes of Picabia, Lichtenstein and Craig Martin, as well as of linocuts and the hand-painted adverts found in African beauty parlors. 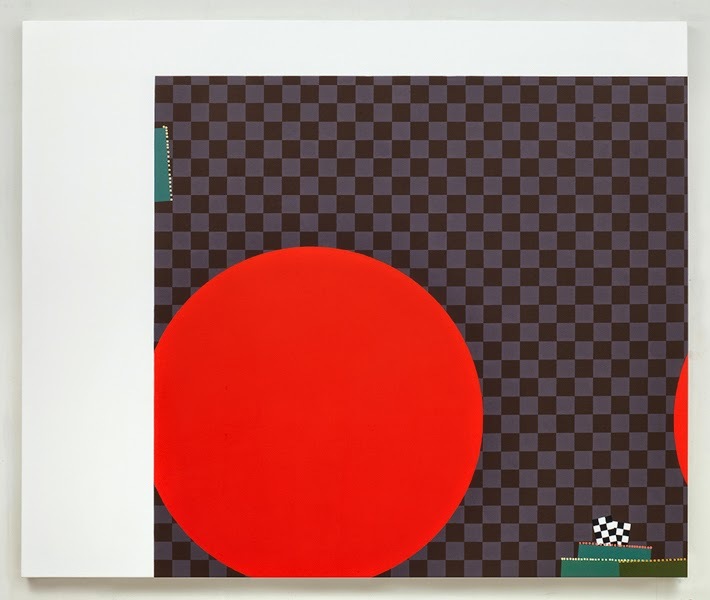 Daniel Sturgis, for all this is his first Art First outing, has been riffing on abstract langauges – notably the check and the blob – for two decades. Yet his approach remains fresh, and I like the way each painting is set slightly differently off kilter here, often using the device of irregular white bands around the coloured zones. The results are playful yet generate a certain anxiety. 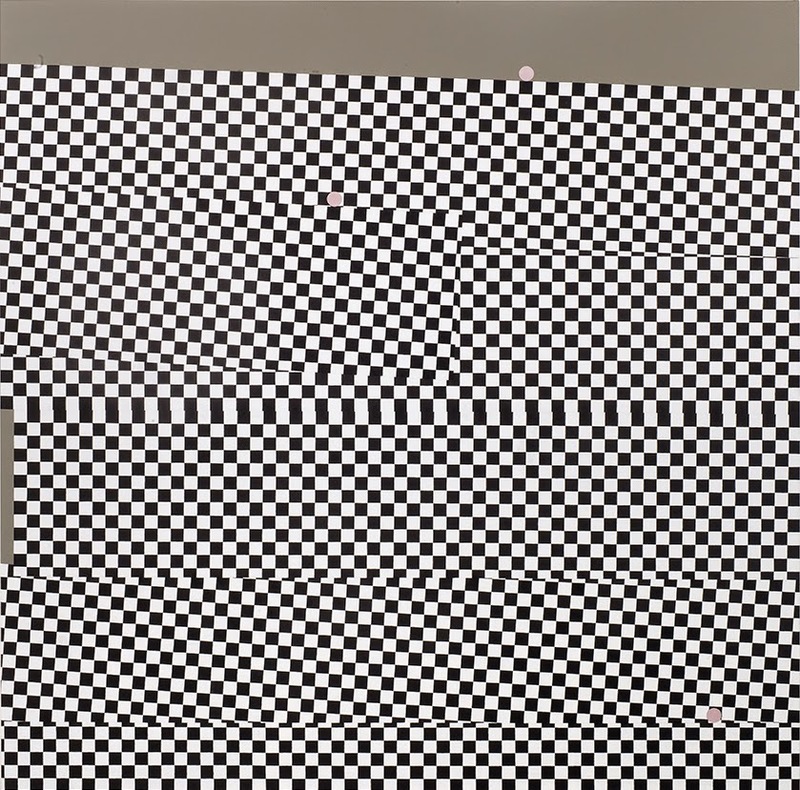 Learning to Fail, for example, in which the black and white Riley references (which dominate elsewhere) are reduced to a token, sees the boundary give the illogical impression that there wasn’t room to fit all the stop sign onto the canvas, so some has slid round to the other side. There are plenty of big shows which it hardly seems necessary to mention such as Veronese, all theatre and colour at the National Gallery, any lack of depth well-aligned to modern tastes – or at any rate to mine; Phyllida Barlow in ramshackle glory at Tate Britain; and Giuseppe Penone at Gagosian. And the less convincing: Schnabel at The Dairy, for example, or Herman Bas’s two sites for Victoria Miro. Then there are mixtures like Chris Marker at the Whitechapel, and Saatchi’s new ragbag of South America and Africa… if you’ve never been to the excellent Jack Bell Gallery, there’s a crash course here as three rooms are given over entirely to expanded versions of four of the African explorer’s lively shows. Still, Pangaea’s signature room is its first: Rafael Gómezbarros’ 440 giant ants swarm the walls, each made of two cast human skulls with branches for legs, and held together by dirty bandaging.